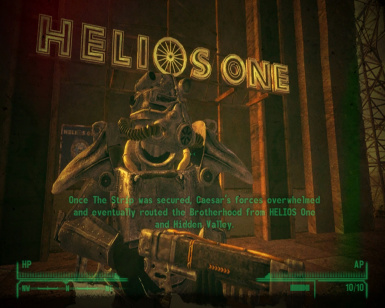 This allows you to spare the brotherhood while siding with the Legion. Initially you would have been able to spare the brotherhood while siding with the Legion, but for whatever reason they removed this option. 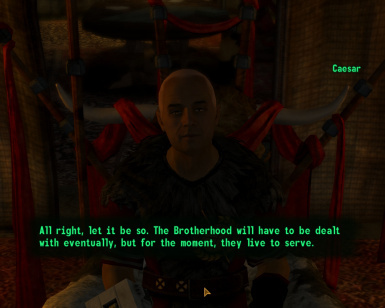 It's only two lines, there is supposed to be more content to this but I'm unable to find the brotherhood dialogue for the quest, I'm assuming it was deleted before the game was released. Also it's fully voiced and lip synced. 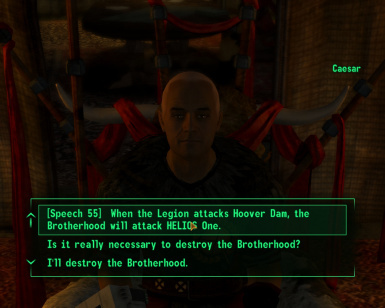 IMPORTANT: If you want to spare the Brotherhood, you need at least 55 speech. I Might add a reputation option at a later date. In version 2 I fixed the issue of the speech failure option not showing. I've tested it, it's working fine (at least for myself). The appropriate ending slide plays, but there's one tiny issue after passing the speech check you have to talk to Caesar to initiate the Et Tumor, Brute? quest but other than that it runs smoothly.